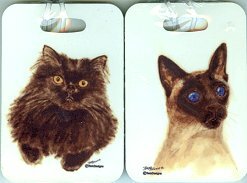 This tag can be used on your luggage or your cat carrier. Each hard plastic tag is 4" high x 2 3/4" wide. A clear plastic loop is included for fastening. On the back of the tag is a form to add name, address, city, state and phone number. Select either the black cat or the Siamese cat.